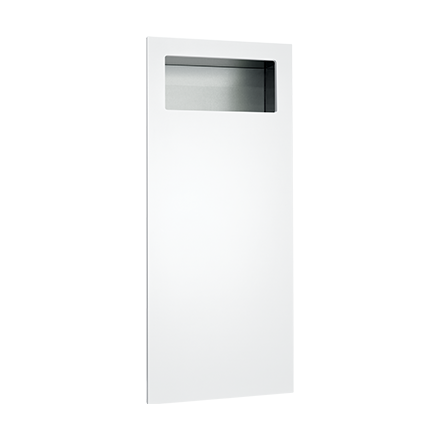 This sophisticated waste receptacle is designed to be completely recessed into the plane of the washroom wall, highlighting the seamless design that defines Piatto™. The phenolic door is attached to the cabinet using field-adjustable, furniture quality hinges and is secured shut by an internal spring-loaded latch. All hardware is concealed giving the Piatto™ Collection its minimalist appeal. Waste receptacle holds 12 gal. (46 L) of washroom waste materials. Waste is inserted through opening at upper section of waste container, which is emptied manually.